Before I introduce my favorite historical female, the thing you need to know about me is that like most writers I have an “introverted” personality. Now, this does not mean that I’m shy or lacking in social skills, (although I must admit, I imagine hell as a place of eternal mingling—much scarier than fire to me). It simply means that I need time alone. Desperately. In order to refuel and process information, I crave time to myself. The second thing you need to know about me, is that I hate noise. I won’t bore you with the tales of my long struggle with sound sensitivity. Suffice to say although I’m doing much better, noise is not my friend. Next, imagine my home around 6pm on a school day. All three kids are home. Their neighborhood friends have descended in droves. My two little matli-poo dogs are worked up and yapping at the random children dashing about my house. The TV is blaring in the living room, accompanied by the sounds of video games trickling from the game room. Do I hear someone banging on the piano? No, not the drums. My energetic husband crashes through the door, yelling into his phone, in Arabic no less…honey, I’m home. Is it any wonder I sometimes dream of checking into a convent? Okay, so the truth is, I rarely let things go that far. Still there are those moments when I crave a simple life of quiet contemplation. My female inkspot is St. Catherine of Siena. St. Catherine was born in Italy in the mid 1300's. She is known for her amazing life of quiet contemplation, visionary insight, and devotion to God. I relate with this medieval nun for a number of reasons. She was a poet, like me. She wrote about intimacy with God, as I love to do. She was a worshipper, as I am. My first novel Dance of the Dandelion is set in the medieval era, not because I love knights and ladies and jousts (although, let’s face it, who can resist a good joust), but because I found in that time period amazing historical figures who fascinated me. 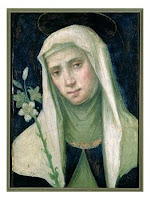 St. Catherine of Siena along with a number of other famous Catholic writers like St. Francis of Assisi and Thomas Aquinas are known as the Medieval Mystics. Now this is not to be confused with our current use of the term “mystic” which is often associated with new age philosophy. The medieval mystics were known for their intensely spiritual, and often supernatural encounters with God. They experienced very intimate and personal relationships with Christ. Once when struggling with my role as a woman in the church, I read a book called Women of Destiny by Cindy Jacobs. I no longer have the book since I passed it along, as I so often do with wonderful books, but in it I remember she said something like this. We need to stop asking if women belong in leadership and instead ask where do we desperately need women in leadership? Women reflect half of the image of God, and when we remove them from positions of influence, we rob ourselves. One of the main areas where Jacobs concluded we need the guidance of women is in understanding intimacy with God, and what it truly means to be the bride of Christ. In the case of St. Catherine, she had what she described as a “Mystical Marriage” with Jesus. At which point, He prompted her to leave her withdrawn life and go out into the world to minister to the needs of the sick and the poor. Hmm, so as I sit here admiring this very influential and spiritual woman, perhaps God is reminding me that I too am called to go out into the world. God is not about catering to our comfort zones. He calls us to spend time alone with Him to gain the relationship we need in order to go forth and change the world. So while I may require those special moments of worship, prayer, and intimacy with my heavenly father, in the end, it’s not about me. What a shock. It’s not about me? For example, this summer I felt that God was leading me to hold a small ladies’ Bible study for a few close friends. In some ways, these ladies were sick and starving spiritually, yet I was terrified to do it. The last time I led a church cell group, I tried to take on too much. I tried to do it in my own strength, and quickly burnt out. Yet another application of the “it’s not about me” principle: I can’t change or fix people on my own, that’s God’s job. Well, I did the Bible study. I determined to leave it in God’s hands and not take any stress or pressure. You know what, it was a huge success, and I ended up getting blessed as much or more than anyone else. No, It’s not about me. It’s all about Jesus. About accomplishing His purposes. About releasing His kingdom here on earth. I think St. Catherine got the message, and I’m beginning to also. Well, I suppose I’ll hold off on that convent for now, although I may occasionally hide my head under a pillow for a few brief moments of solitude. But enough about me (especially since I keep rambling on that it’s not about me.) I should let St. Catherine speak for herself. within the garden of your breast. with the fruit you gave them. to fill her with your blessedness. and the sea in the fish. Dina, your vision of hell gave me the shivers. I truly understand the allure of a convent. God. Me. One day pretty much the same as the next. What? we're supposed to 'go out' into all the world? Seriously I love your introduction of St. Catherine of Sienna and I know how much you looked forward to posting about her. It shows. She truly was an inspirational woman and your post has reminded me of things I don't always want to be reminded of. Thanks Dina for sharing your story--her story. Beautiful! inspiring post - love St. Catherine's poem! Thanks. Lori, I love all of St. Catherine's poetry. It's very inspirational. Thanks for stopping by today. Deb, I figured in a group of writers plenty of people would understand my "small talk" phobia. I do like writer's conferences, though, because small talk centers around writing and literature. Can't beat that. Oh, I LOVED how you tied your craving for quiet with the life of St. Catherine. A beautiful, timely post for all of us women who deal with the chaos that masquerades under the name "daily life." I'm always glad to know there are others like me! Thank you for this glimpse into St. Catherine's life as well as yours. It was a wonderful way to start the day. We had a party at the house last night. Maybe 40 youth and 10 adults, not including my family. While I had a great time (and think everyone else did too), I am so enjoying the quiet solitude of my house this morn. Four kids are off to school. Toddler is upstairs sleeping next to her daddy. The dog is laying next to my chair. Okay, the dog has now stood up and is eyeing my bowl of cereal as I eat it. I gave him my "I'm not sharing with you" look. He went away. Great post, Dina! Lovely poetry. And thank you, Gina, for that play by play account of your morning. I feel like I'm sitting there and drinking coffee with you. Tell your dog I said hi. Dina, what a lovely post. Your writing just flows. Small talk is not my forte` either. I cherish my time alone. Even in a crowd, I like being 'alone' and observing. Have a lovely quiet day. Lovely post, Dina. Solitude, quiet, ahhh. Those words are akin to "treat" and "rare" in my house! How inspiring to look to the example of a woman who let God have His way in her life. I love your quote: "God is not about catering to our comfort zones." He has certainly been moving me out of my comfortable spots lately! Thanks for the book recommendations, too. And here all this time (without fellow writers to commune with) I've believed (and been told by my entire family) I was just an antisocial weirdy! I think my vision of hell has just been revised... I'd always just pictured a permanent camping trip, but endless small talk? Eek! So should we start a "Happy Introverts" club within the inky sisterhood? Niki and others, I confronted my husband not long ago about how he often makes me feel like some sort of inferior Christian because I don't like to socialize as much as he does. I think his response was something along of the lines of--it doesn't make me a worse Christian, just less societally correct, which is cool by me. I try to make praying and hearing from God my marker. If my husband feels like we absolutely have to meet some social obligation, and I don't feel like God is asking me to, I put down my foot and say no. At least I have one reasonably introverted child to keep me from feeling like a total freak of nature. For the record, I've noticed that the majority of writers have the INFJ personality on the Meyers Briggs scale, which is supposed to also be the most rare. You sum up perfectly the tension in our lives between the desire/need to withdraw to be in God's presence and the call to be in the world sharing all he's given us. In this world of non-stop air traffic, the constant whir of cars, and 24 hrs a day of "entertainment" it is hard to cultivate alone. We were once challenged in a sermon to get into the car and NOT turn on the radio. I find it a difficult thing to do. Maybe in the spirit of Siena, I'll try more of that planned quiet in my day. I guess it's no surprise that so many of us crave our alone time. I know I do. I'm sure it's one of the reasons I married my hubby. He's very out-going and loves to talk to other people. He's got a great sense of humor and more energy than I could dream of. I can socialize with ease, but I love to talk with other friends one to one or in a small intimate group. No extravert here. I could be wrong, but I think Jesus was an introvert at heart. I think he loved going off to pray and contemplate by himself and get away from it all. No wonder it thunders when hot air and cold air meet. Love you baby... remember it is not about you, it is about me. And you all thought he was sweet. St Catherine has always been one of my favourite 'saints.' I'm so glad to read about her today on your post...thank you for sharing her poem. Hi Dina. Small talk gives me the shivers, too. I am not good at expressing myself verbally. Solitude is one of my best friends, and most of the people in my life don't understand it. Lovely poem, lovely post. Thank you!